How does Snowplow Analytics work? How much does Snowplow cost? 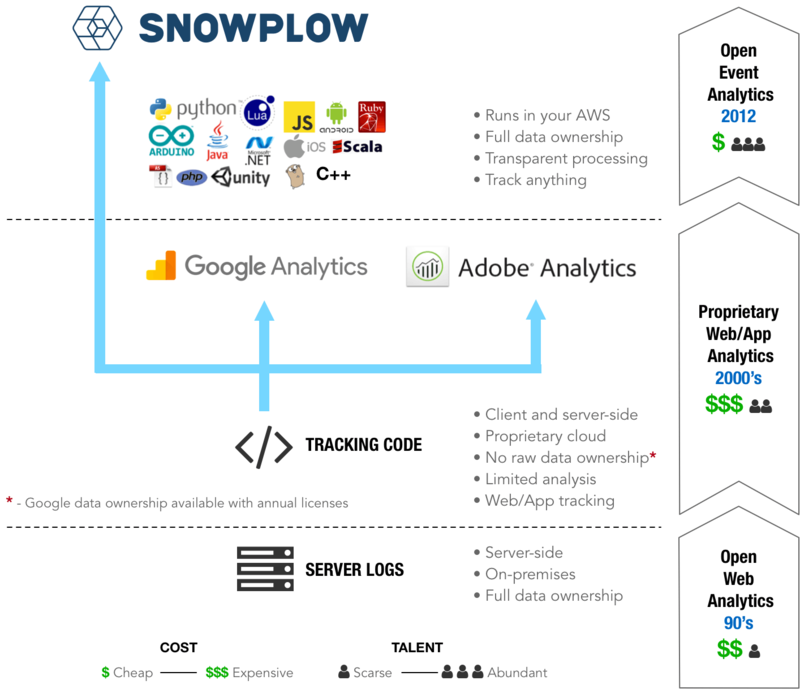 Snowplow Analytics is an open-source enterprise event-level analytics platform that enables data collection from multiple platforms for advanced data analytics. Snowplow Analytics users include DollarShaveClub.com, Capital One, FunnyOrDie.com, StumbleUppon.com, among others. In short, Snowplow Analytics is similar to Google Analytics 360, Adobe Analytics or Mixpanel with some key and important differences. Create a single customer view by stiching data from each channel and platform. Integrate CRM, Sales, Inventory, Call center, etc. Snowplow Analytics is open source and runs in your Amazon Web Services account, or Google Gloud Platform, giving you full ownership of the data and processing rules. It leverages state-of-the-art cloud services like Amazon Kinesis, Redshift and Elastic Map Reduce to provide an analytics platform that can scale linearly and in realtime. With Snowplow Analytics there are no product limitations, e.g. data refresh times, which data you can store, obscure attribution rules or limit on the number of variables, you are free to use Snowplow to incorporate your business rules and needs. Add business context to your analytics with custom contexts, self-describing JSON payloads that can be sent with each event. With custom contexts, the different business stakeholders (marketing, executives, sales, support, etc.) can have conversations on metrics with the business context, which drives insights and action. With Snowplow you can track websites, mobile applications, games, software and even hardware with one of the available trackers. To understand why Snowplow Analytics represent a new paradigm we need to understand how digital analytics evolved. In the mid and late 90's web analytics technology was not designed to scale and required physical hardware, which was hard and expensive. The first SaaS digital analytics company were born: WebSideStory, Urchin, and Webtrends later Adobe Analytics and Google Analytics respectively. By building their infrastructure and providing analytics as a service, these companies provided a straightforward and easy solution to web analytics. But with this came a drawback, you lost access to your raw data. 20 years passed, and cloud computing democratized data storage and processing, making it inexpensive and accessible to all. Data scientists need data to predict churn, create unified customer views, prevent fraud and other mind boggling things. It was time to design a new analytics platform leveraging the 21st-century technology and the advent of cloud computing. Snowplow Analytics was born in 2012. It's time to get your data back. Welcome to Snowplow Analytics. Snowplow Analytics marks the democratization of digital analytics, where now you can easily own your analytics infrastructure, much like Google, Adobe and others, and run analytics using your business rules, without product limitations.